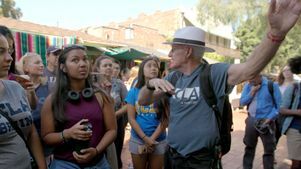 When UCLA history professor Teo Ruiz leads a tour of downtown Los Angeles, you’d better be wearing comfortable shoes to keep up. As the crowded Metro Rapid 720 bus heads east on Wilshire Boulevard, the 20 UCLA undergraduates on board are captivated as they pass the marble and travertine Scottish Rite Masonic Temple with its 14-foot tall figures adorning the building’s façade. Moments later, Teo Ruiz, UCLA distinguished professor of history, starts his first impromptu lesson of the day with a brief discussion about Freemasonry in Los Angeles. 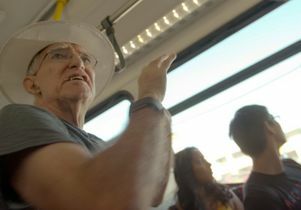 During the 12-mile journey, Ruiz launches into mini-lectures about communities like Century City and Beverly Hills, points out popular local attractions such as Rodeo Drive and the La Brea Tar Pits, and when the bus passes sections of the Berlin Wall, which are part of the collection of the Wende Museum, he tells students these are part of the largest collection of pieces of the wall outside of Germany. Every fall through the Fiat Lux seminar, “History 19: UCLA Centennial Initiative: UCLA in Los Angeles,” the city becomes the classroom as Ruiz transforms the sights, smells and sounds of Los Angeles into lessons on urban life, architectural eclecticism and social inequality. “I’ve lived in L.A. my entire life and I didn’t even know part of the Berlin Wall was there. That was pretty crazy!” said Michael Quicho, a first-year biology major and first-time bus rider who added that at first he felt confused and overwhelmed about riding the bus but ultimately the transit experience taught him a valuable skill. Quicho’s comment is music to the ears of Beserat Hagos, director of Fiat Lux, who said that experiential learning is one of the highlights of the program. UCLA history professor Teo Ruiz leads students on a tour of Los Angeles that starts and ends on a city bus. When the students look out the windows, they see malls with signs in Spanish and Korean. Ruiz tells them that Los Angeles is the second largest “Hispanic City” in the world outside of Mexico City and boasts the largest Korean population in the United States. To illustrate this lesson, Ruiz tells students that they are about to head toward the edge of Skid Row. The students had been told this would be a part of their day and after just a few steps, the sidewalks are impossible to walk because of the tents and shelters set up by the people living there. Led by Ruiz, the students start walking in the street. Students begin to hear shouts from people occupying the tents. “You think you’re better than us!” one person yells. “Don’t drop out! Stay in school or this is where you might end up,” another says. The students walk only about three blocks and just as suddenly as the tent city appeared, it disappears. Immediately Ruiz shares the history of Skid Row and notes how Los Angeles became the capital of homelessness in the United States. “Seeing it in person made the homeless epidemic more real and tangible,” said Emily Pham, a first-year psychobiology major from Los Angeles, who said she hadn’t previously given much thought to the city’s homelessness problem. While most of the students said Skid Row was the most memorable part of their tour, some were ambivalent about going there. 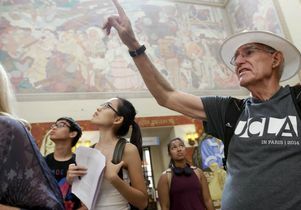 Teo Ruiz takes his Fiat Lux students to the Central Library and shares the history of the frescoes. As an educator, Ruiz said that part of his responsibility is to allow students to not only observe the architecture and culture of the city, but the realities of homelessness, poverty and gentrification as well. Next Ruiz leads the students at a fast pace north toward Union Station. Along the mile-and-a-half walk the group passes through Little Tokyo and Ruiz points out the Japanese American National Museum. The group soon arrives at the largest passenger railroad station in the West. With the students gathered around him, Ruiz highlights the building’s history and points out its heterogeneous design, which is comprised of Art Deco, Mission Revival and Streamline Moderne styles. The next step on Ruiz’s tour is historic Olvera Street. 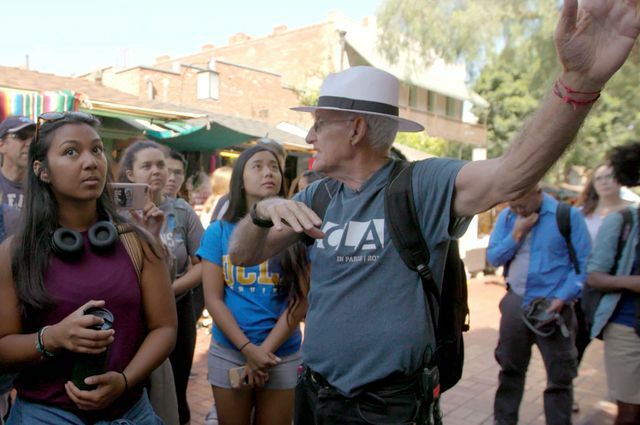 He takes the students through Avila Adobe, which was built in 1818 and the students learn that it’s the oldest standing residence in Los Angeles. 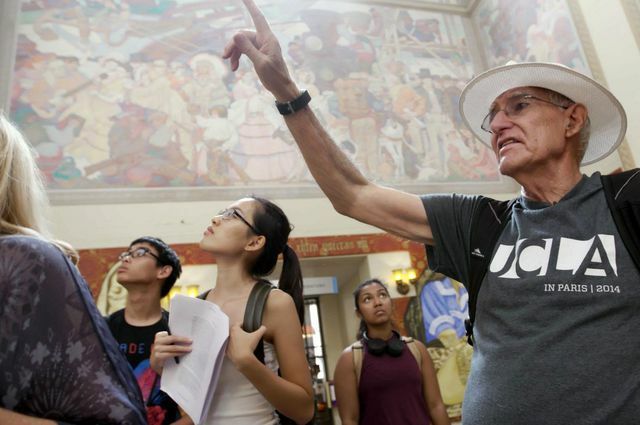 UCLA history professor Teo Ruiz tells his students about the history of Olvera Street. They all continue toward Our Lady Queen of Angels Catholic Church and are soon enveloped by families. Ruiz later explains that the little boys and girls in white were preparing to enter the church to get baptized. The students are now halfway through the tour and Ruiz has yet to take students to sights like the Cathedral of Our Lady of the Angels, where students sit in on a traditional Catholic wedding performed in Spanish. 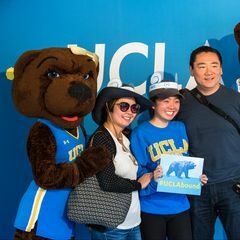 They visit iconic downtown locations such as One California Plaza, The Broad art museum, Walt Disney Concert Hall, the Museum of Contemporary Art and the Grand Central Market. After sampling various cuisines at the 100-year-old food emporium, the tour culminates by visiting architectural and historical gems such as the Oviatt Penthouse, the Bradbury Building, the Millennium Biltmore Hotel and the Los Angeles Central Public Library. After five hours of walking around and learning about the history of Los Angeles, Ruiz still has his energy but he can tell the students are getting tired. The group heads to the nearest 720 bus stop to go back to Westwood.